Molly Brown and Scandal headline a pool with Nemesis and Wildfire. Denver Molly Brown vs. Washington DC Scandal has quietly been one of the best rivalries in the division over the last several years, and that matchup is the headliner in Pool D. This grouping is always fun with the 4-5 matchup and a no. 9 seed that hopes to not be too far behind. There’s good reason it’s often the most anticipated Nationals pool. It probably doesn’t quite top the exciting Pool B this year for overall quality, but Pool D still features the games that are likeliest to shake up the top of the division. #4 Denver Molly Brown enters Nationals in a pretty similar spot to where they’ve been since 2015. They enter as one of the top four seeds, but they have still yet to make the break through to make a national final. In fact, they’re the only team in the Big Four to not make a final in the three year stretch since they made their first semifinal appearance. Until Molly is able to find a way to get over that semis hump, they’ll continue to be the clear fourth team in a Big Four that maybe should be considered a Big Three. Before they can worry about a shot at a title, Denver has a tough pool play matchup with Washington DC Scandal, the team they booted from the top four pantheon in 2015. The two have a rich Nationals history, though lately they have faced off more frequently in bracket play. They have played in quarterfinals each of the past three seasons. But the pair played each other at Nationals — either in the no. 4 vs. no. 5 matchup in pool play or in quarterfinals — every single season since 2011.3 That matchup at the turn of Pool D is always one of the most anticipated pool play matchups, but with these two, there’s obviously a little extra intrigue. 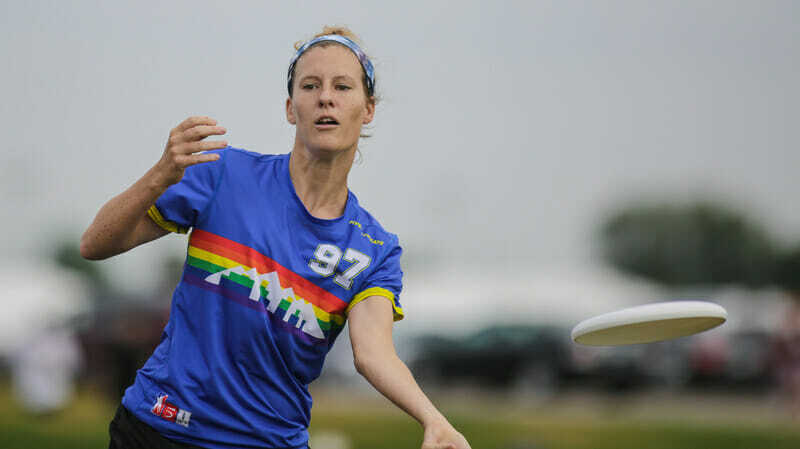 If Molly Brown does top Scandal, though, and presumably make it back to semis, can they finally go one better and make the championship game? They’re 1-5 against the top four this season, if you include WUCC. Their one win came over San Francisco Fury, a 15-13 victory at the Bay Area Invite. So they have one win this year to take confidence from, but they also have a few tight losses against the top three teams as well. They lost to Riot 12-11 in the Pro-Elite final, nearly pulled off a comeback against Brute Squad in the semis at U.S. Open before losing 15-13, and lost to Riot again at Bay Area Invite 15-13. Molly doesn’t quite have the depth of talent as their regular semifinals competitors, but their top end is good enough to keep them in games late, and if you’re in games late, you always have a chance. Scandal hasn’t beaten a top four team since September of 2017. They’ve still been considered the fifth best team in the division through much of that dry spell, but the DC club will certainly want to end that run in San Diego. If #5 Washington DC Scandal‘s performance at Pro Championships is an indication, they’re as close to the top four as they’ve been in a long time. In New York, they played a tight first half with Brute Squad, the number one team in the division. They faded late in the second half, but it was still a performance they can feel good about. Scandal simply doesn’t have the top end talent of the four teams seeded above them, and it’s been well documented that they lost their two most illustrious players from last year. But they are a much deeper team this season, and when executing, they will give a game to anybody. Scandal will force Molly Brown to make plays to beat them, and they should prove a genuine test for any of the top four teams they end up facing. Their rookies have settled in well, and they have several Breakout POTY candidates. They don’t have a Claire Chastain-type on the team, any one player that they can rely on to carry them through stretches of the game, but they’ll use their deep cast of solid players to try to beat opponents with a complete team effort. Scandal has defied expectations simply by being the no. 5 seed at Nationals. Ultiworld had them at #9 in the preseason rankings. But Scandal has been exceeding outward expectations for several seasons now. Who’s to say they won’t do it again this week? It’s tough to be the no. 9 seed: so close to being the second best team in your pool, and instead you get two seemingly insurmountable teams ahead of you. The no. 9 seed hasn’t finished better than third in Pool D since Texas Showdown won the pool in 2013. Since then, the third seed in the toughest pool has only managed to finish third or fourth. It’s tough to see Nemesis breaking that trend. But that doesn’t mean Nemesis should be discounted. It’s been a nice bounce back year for them, after missing Nationals in 2016 and landing at the no. 16 Seed in 2017. They have a strong chance of making quarterfinals, they’ll just likely have to do it by beating a team with a better pool play record in prequarters. Though they will first have to avoid an upset at the hands of San Diego Wildfire, a team they have not played yet this season. Craig Poeppelman’s ELO rankings give Nemesis a 61% chance of holding onto that third spot, the highest likelihood of any team to finish third, and a 34% chance of making quarterfinals. Nemesis has looked like a fringe quarters team for much of the season, and they still feel like that now. It’ll likely come down to how the bracket shapes up for them, and if they’re able to put that one key game together in prequarters. They’re a team who does not rely on any few players, and, like Scandal, uses a complete team approach to grind out games. They’re deep enough that they can be successful with that approach, but they have had issues with slowing down truly elite playmakers this season. Phoenix’s Jenny Wei proved to be particularly dominant against them in the final of Elite-Select Challenge. If an individual opponent catches fire against Nemesis, that could be the difference between them making quarterfinals or missing out. Wildfire comes in as the 19th ranked team in the country after Regionals. That’s tied for the second lowest ranking of a Nationals attendee in the Women’s Division since the Triple Crown Tour began, and tied for the lowest of a team that had earned a strength bid. The good news for Wildfire is the other two teams — 19th ranked Portland Schwa in 2016 and 21st ranked Nemesis in 2015 — both upset the no. 9 seeds to finish third in the pool! Wildfire’s resume also feels stronger than that of a 19th ranked team. They’ve suffered a handful of close losses, including to Rival, Pop, Phoenix, and Nightlock. A lack of quality wins is where the resume gets a little thin for Wildfire. They have just one victory over a Nationals team, an 11-8 win over Schwa at Pro-Elite Challenge. Otherwise, their best wins are two 10-9 results over #17 Texas Showdown. Wildfire feels like a team that can win a game at Nationals, but they just haven’t really proven themselves up to that task yet in 2018. They do have home field advantage, though, and some top end playmakers like Kristen Pojunis. If they can turn take advantage of that home field magic and turn those one-goal losses into a close win, than Wildfire can certainly break seed. Comments on "Club Championships 2018: Pool D Preview (Women’s)"